I graduated from the University of Bristol in July 2000. According to my mother, I had wanted to become a vet since the age of 3! My first veterinary-related job was at P.G. Andre Surgery, Richmond, where I had seen practice since the age of 15, and where I worked as a veterinary nursing assistant before going to university. I completed the IVAS (International Veterinary Acupuncture Society) course in veterinary acupuncture in 2001. After 3 years of working at P.G. Andre as an assistant, I was made manager at the branch surgery, Twickenham Veterinary Surgery. When I first took over the surgery we were still only open for a few hours every day, within a year I was there full time. 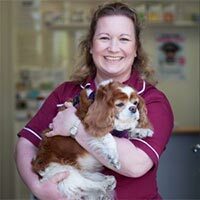 Since taking on Twickenham Veterinary Surgery I have put everything I have into building the surgery and providing the care for my patients that I would want my own pets to have. I feel incredibly lucky and honoured to be able to treat the pets of Twickenham and to have been accepted as part of the fantastic community that we share.